Austrian architect Johann Obermoser has cantilevered a lair-like concrete volume from the precipice of a mountain in Sölden, Austria, to house an exhibition exploring the history of James Bond. 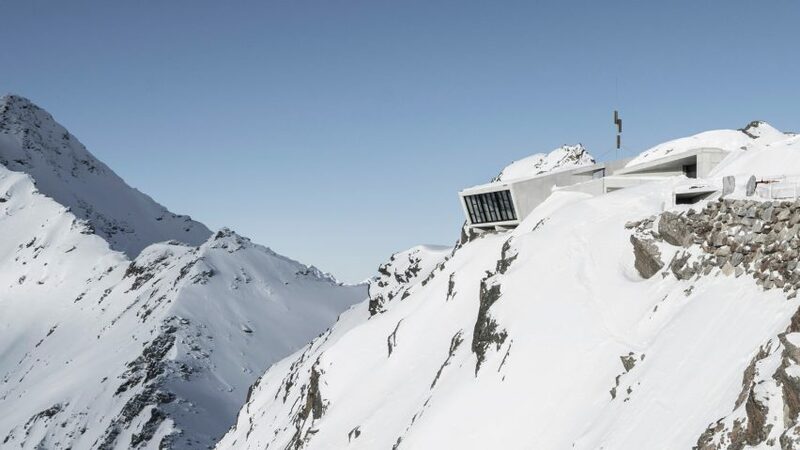 The 007-style building can be found at the summit of the Gaislachkogl Mountain in Sölden – the setting for an action-packed snow chase sequence in the 2015 film Spectre. Built within the mountain and arranged over two levels at an altitude of over 3,000 metres, the 1,300 square-metre structure is one of the highest museums in the world. Both the exterior and interior design take cues from the work of late James Bond production designer Ken Adam, particularly his use of dynamic angles and geometric shapes, and the muted palette of his materials. Applying Adam's design ethos to a 21st-century building, the mountaintop complex could be mistaken for the secluded hideaway of a modern 007 villain. Tucked away within an Austrian ski resort village, the building is only accessible to visitors by cable car. Obermoser designed the building to blend in with its surroundings, using concrete that echoes the mountainous terrain. Housed inside is the 007 Elements exhibition, stretched over 10 different rooms to take visitors through a series of installations that illustrate each step in the making of a James Bond film. While the installation focuses on Spectre, which was shot in Sölden, it also explores other titles in the long-running 24-film Bond franchise. Creative director Neal Callow – who was artistic director on the last four James Bond films – and head of design Tino Schaedler worked together to design the 007 Elements exhibition concept. "Our aim with 007 Elements is to tell the story of the making of 007 films in an ultra-modern, emotive and engaging way," explained Callow. Callow and Schaedler wanted the architectural space and the exhibition content to come together to create a symbiotic experience, to make visitors feel as if they are inside a 007 movie. "We want to use this incredible location to place our guests into Bond's environment, and bring the stories to life in a unique and unforgettable way," he added. Their aim was to create a sequence of rooms that unfold like scenes in a movie, with the design of each space integral to the story they want to tell. "We studied the set designs of Ken Adam, which have a distinct language; he very much designed for the camera. Specific angles and positions in the room make the designs shine as the dynamic nature of his compositions unfold at those points," Schaedler told Dezeen. "We used the same technique. There are areas in the rooms that visitors are naturally led to – due to the layout and content – where the spaces have a shining presence," he continued. The exhibition opens with an atmospheric anteroom called Barrel of the Gun, which focuses on the innovative title sequences and dramatic music that are synonymous with the 007 films. This entry room leads onto the open-air Plaza, which features an angled floor-to-ceiling glass window that frames the panoramic views of the mountains beyond. The next room was designed to emulate the type of lobby that Bond would enter upon his arrival at a villain's lair. It screens a film narrated by director Sam Mendes that takes visitors through the history of the Bond movies from the very first film in 1962, Dr.No, to the latest film from 2015, Spectre. Adjacent to this is the Lair room, focusing on characters and their scene-stealing dialogue, the Briefing room that gives visitors an insight into the movie location choices, and the Tech Lab room that looks into some of the cutting-edge technology featured in the productions. The Action Hall focuses on the work of the special effects and stunt departments, and the Screening room showcases the Austrian action sequence from Spectre with a renewed understanding of how it was created. The final Legacy Gallery allows visitors to explore an extensive 007 archive via interactive touch screens. The museum opened to the public on July 12. The exhibition is permanent, but has been designed in such a way that makes it possible to update in order to keep it relevant as the 007 franchise continues to release more films. Obermoser designed a 49-square-metre hatch in the roof of the building so that large items, such as the aeroplane currently on display in the Action Hall room, can be removed and replaced with other large items that feature in upcoming movies. The Innsbruck-based architect also designed the cable car station and the glass-walled ICE Q restaurant located next to the exhibition building, which was used as the private medical clinic, Hoffler Klinik, in Spectre. James Bond has been an inspiration for many architecture projects. Studio B29 designed a "James Bond super garage" for a home near Lake Geneva, where the owner – an undisclosed royal – keeps his classic cars and motorcycles, including an Austin Healey Sprite.